1305870638 -Discover all of the latest advancements that Microsoft Access 2016 has to offer with MICROSOFT OFFICE 365 & ACCESS 2016: COMPREHENSIVE — the new edition in the acclaimed Shelly Cashman Series books. For more than three decades, the Shelly Cashman Series has effectively introduced advanced computer skills to millions of students like you. 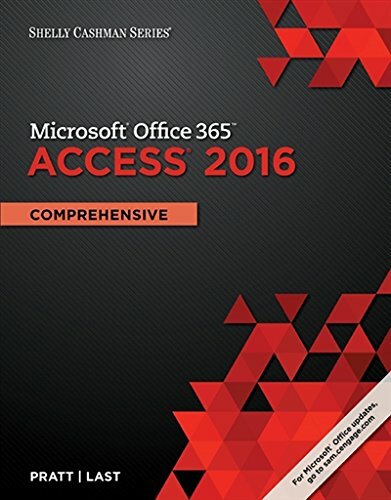 MICROSOFT OFFICE 365 & ACCESS 2016: COMPREHENSIVE provides an enhanced learning approach to help you master all aspects of Microsoft Access 2016, no matter what your learning style. A trademark, step-by-step, screen-by-screen approach encourages you to expand your understanding of Microsoft Access 2016 through experimentation, critical thought, and personalization. This new edition delivers effective educational materials specifically designed to introduce more advanced features, improve retention, and prepare you for success in using Microsoft Access 2016.